The antibody immunogen shares 90% homology with ARRB2 (P32121) which has similar MW than ARRB1. Therefore, it is likely that the antbody will cross-react with ARRB2. However, we haven't performed any experiment with recombinant protein to confirm this. Synthetic peptide within Human beta Arrestin 1 (N terminal). The exact sequence is proprietary. WB: HEK293, Jurkat, SH-SY5Y, C2C12 and PC-12 cell lysates. IHC-P: Human lymph node, human breast carcinoma, mouse cerebral cortex and rat cerebral cortex tissues. ICC/IF: PC-3 cells. Our Abpromise guarantee covers the use of ab32099 in the following tested applications. WB 1/500 - 1/1000. Predicted molecular weight: 50 kDa. Flow Cyt 1/10 - 1/20. Functions in regulating agonist-mediated G-protein coupled receptor (GPCR) signaling by mediating both receptor desensitization and resensitization processes. During homologous desensitization, beta-arrestins bind to the GPRK-phosphorylated receptor and sterically preclude its coupling to the cognate G-protein; the binding appears to require additional receptor determinants exposed only in the active receptor conformation. The beta-arrestins target many receptors for internalization by acting as endocytic adapters (CLASPs, clathrin-associated sorting proteins) and recruiting the GPRCs to the adapter protein 2 complex 2 (AP-2) in clathrin-coated pits (CCPs). However, the extent of beta-arrestin involvement appears to vary significantly depending on the receptor, agonist and cell type. Internalized arrestin-receptor complexes traffic to intracellular endosomes, where they remain uncoupled from G-proteins. Two different modes of arrestin-mediated internalization occur. Class A receptors, like ADRB2, OPRM1, ENDRA, D1AR and ADRA1B dissociate from beta-arrestin at or near the plasma membrane and undergo rapid recycling. Class B receptors, like AVPR2, AGTR1, NTSR1, TRHR and TACR1 internalize as a complex with arrestin and traffic with it to endosomal vesicles, presumably as desensitized receptors, for extended periods of time. Receptor resensitization then requires that receptor-bound arrestin is removed so that the receptor can be dephosphorylated and returned to the plasma membrane. Involved in internalization of P2RY4 and UTP-stimulated internalization of P2RY2. Involved in phopshorylation-dependent internalization of OPRD1 ands subsequent recycling. Involved in the degradation of cAMP by recruiting cAMP phosphodiesterases to ligand-activated receptors. Beta-arrestins function as multivalent adapter proteins that can switch the GPCR from a G-protein signaling mode that transmits short-lived signals from the plasma membrane via small molecule second messengers and ion channels to a beta-arrestin signaling mode that transmits a distinct set of signals that are initiated as the receptor internalizes and transits the intracellular compartment. Acts as signaling scaffold for MAPK pathways such as MAPK1/3 (ERK1/2). ERK1/2 activated by the beta-arrestin scaffold is largely excluded from the nucleus and confined to cytoplasmic locations such as endocytic vesicles, also called beta-arrestin signalosomes. Recruits c-Src/SRC to ADRB2 resulting in ERK activation. GPCRs for which the beta-arrestin-mediated signaling relies on both ARRB1 and ARRB2 (codependent regulation) include ADRB2, F2RL1 and PTH1R. For some GPCRs the beta-arrestin-mediated signaling relies on either ARRB1 or ARRB2 and is inhibited by the other respective beta-arrestin form (reciprocal regulation). Inhibits ERK1/2 signaling in AGTR1- and AVPR2-mediated activation (reciprocal regulation). Is required for SP-stimulated endocytosis of NK1R and recruits c-Src/SRC to internalized NK1R resulting in ERK1/2 activation, which is required for the antiapoptotic effects of SP. Is involved in proteinase-activated F2RL1-mediated ERK activity. Acts as signaling scaffold for the AKT1 pathway. Is involved in alpha-thrombin-stimulated AKT1 signaling. Is involved in IGF1-stimulated AKT1 signaling leading to increased protection from apoptosis. Involved in activation of the p38 MAPK signaling pathway and in actin bundle formation. Involved in F2RL1-mediated cytoskeletal rearrangement and chemotaxis. Involved in AGTR1-mediated stress fiber formation by acting together with GNAQ to activate RHOA. Appears to function as signaling scaffold involved in regulation of MIP-1-beta-stimulated CCR5-dependent chemotaxis. Involved in attenuation of NF-kappa-B-dependent transcription in response to GPCR or cytokine stimulation by interacting with and stabilizing CHUK. May serve as nuclear messenger for GPCRs. Involved in OPRD1-stimulated transcriptional regulation by translocating to CDKN1B and FOS promoter regions and recruiting EP300 resulting in acetylation of histone H4. Involved in regulation of LEF1 transcriptional activity via interaction with DVL1 and/or DVL2 Also involved in regulation of receptors others than GPCRs. Involved in Toll-like receptor and IL-1 receptor signaling through the interaction with TRAF6 which prevents TRAF6 autoubiquitination and oligomerization required for activation of NF-kappa-B and JUN. Binds phosphoinositides. Binds inositolhexakisphosphate (InsP6). Belongs to the arrestin family. The [DE]-X(1,2)-F-X-X-[FL]-X-X-X-R motif mediates interaction the AP-2 complex subunit AP2B1 (By similarity). Binding to phosphorylated GPCRs induces a conformationanl change that exposes the motif to the surface. The N-terminus binds InsP6 with low affinity. The C-terminus binds InsP6 with high affinity. Constitutively phosphorylated at Ser-412 in the cytoplasm. At the plasma membrane, is rapidly dephosphorylated, a process that is required for clathrin binding and ADRB2 endocytosis but not for ADRB2 binding and desensitization. Once internalized, is rephosphorylated. The ubiquitination status appears to regulate the formation and trafficking of beta-arrestin-GPCR complexes and signaling. Ubiquitination appears to occur GPCR-specific. Ubiquitinated by MDM2; the ubiquitination is required for rapid internalization of ADRB2. Deubiquitinated by USP33; the deubiquitination leads to a dissociation of the beta-arrestin-GPCR complex. Stimulation of a class A GPCR, such as ADRB2, induces transient ubiquitination and subsequently promotes association with USP33. Cytoplasm. Nucleus. Cell membrane. Membrane > clathrin-coated pit. Cell projection > pseudopodium. Cytoplasmic vesicle. Translocates to the plasma membrane and colocalizes with antagonist-stimulated GPCRs. The monomeric form is predominantly located in the nucleus. The oligomeric form is located in the cytoplasm. Translocates to the nucleus upon stimulation of OPRD1. Immunohistochemistry (Formalin/PFA-fixed paraffin-embedded sections) analysis of human lymph node tissue labelling beta Arrestin 1 with unpurified ab32099 at a dilution of 1/100. Immunohistochemistry (Formalin/PFA-fixed paraffin-embedded sections) analysis of human breast carcinoma tissue labelling beta Arrestin 1 with purified ab32099 at a dilution of 1/250. Heat mediated antigen retrieval was performed using EDTA buffer pH 9. ab97051, a HRP-conjugated goat anti-rabbit IgG (H+L) was used as the secondary antibody (1/500). Negative control using PBS instead of primary antibody. Counterstained with hematoxylin. 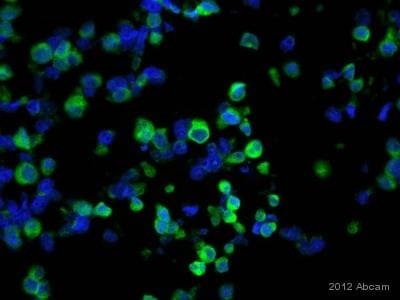 Immunocytochemistry/Immunofluorescence analysis of PC-3 cells labelling beta Arrestin 1 with purified ab32099 at a dilution of 1/150. Cells were fixed with 4% paraformaldehyde and permeabilized with 0.1% Triton X-100. ab150077, an Alexa Fluor® 488-conjugated goat anti-rabbit IgG (1/1000) was used as the secondary antibody. DAPI (blue) was used as the nuclear counterstain. ab7291, a mouse anti-tubulin (1/1000) and ab150120, an Alexa Fluor® 594-conjugated goat anti-mouse IgG (1/1000) were also used. Overlay histogram showing PC3 cells stained with unpurified ab32099 (red line). The cells were fixed with methanol (5 min) and then permeabilized with 0.1% PBS-Tween for 20 min. The cells were then incubated in 1x PBS / 10% normal goat serum / 0.3M glycine to block non-specific protein-protein interactions followed by the antibody (unpurified ab32099, 1/10 dilution) for 30 min at 22°C. The secondary antibody used was DyLight® 488 goat anti-rabbit IgG (H+L) (ab96899) at 1/500 dilution for 30 min at 22°C. Isotype control antibody (black line) was rabbit monoclonal IgG (1µg/1x106 cells) used under the same conditions. Acquisition of >5,000 events was performed. This antibody gave a decreased signal in PC3 cells fixed with 4% paraformaldehyde (10 min)/permeabilized in 0.1% PBS-Tween used under the same conditions. Immunohistochemistry (Formalin/PFA-fixed paraffin-embedded sections) analysis of mouse cerebral cortex tissue labelling beta Arrestin 1 with purified ab32099 at a dilution of 1/250. Heat mediated antigen retrieval was performed using EDTA buffer pH 9. ab97051, a HRP-conjugated goat anti-rabbit IgG (H+L) was used as the secondary antibody (1/500). Negative control using PBS instead of primary antibody. Counterstained with hematoxylin. Immunohistochemistry (Formalin/PFA-fixed paraffin-embedded sections) analysis of rat cerebral cortex tissue labelling beta Arrestin 1 with purified ab32099 at a dilution of 1/250. Heat mediated antigen retrieval was performed using EDTA buffer pH 9. ab97051, a HRP-conjugated goat anti-rabbit IgG (H+L) was used as the secondary antibody (1/500). Negative control using PBS instead of primary antibody. Counterstained with hematoxylin. Unpurified ab32099 staining beta Arrestin 1 in C4-2B (Human prostate cancer cell line) by ICC/IF (Immunocytochemistry/immunofluorescence). Cells were fixed with paraformaldehyde and blocked with 1% serum for 1 hour at 21°C. Samples were incubated with primary antibody (1/100 in diluent) for 1 hour at 21°C. An Alexa Fluor® 488-conjugated goat anti-rabbit polyclonal IgG (1/200) was used as the secondary antibody. Unpurified ab32099 staining beta Arrestin 1 in human prostate carcinoma tissue section by Immunohistochemistry (Formalin/PFA-fixed paraffin-embedded sections). Tissue underwent paraformaldehyde fixation before heat mediated antigen retrieval in Tris/EDTA pH9.0 and then blocking with 1% donkey serum for 1 hour at 20°C was performed. The primary antibody was diluted 1/100 and incubated with sample for 1 hour at 20°C in PBS. A Biotin conjugated donkey polyclonal to rabbit IgG was used undiluted as secondary antibody. Publishing research using ab32099? Please let us know so that we can cite the reference in this datasheet. Thank you for contacting us and for these additional details. Your credit note ID is xxxxxx. I am sorry that this antibody did not perform as stated on the datasheet. I have asked our accounting department to issue a credit note for you, which can be redeemed against the invoice of a future order by passing it on to your purchasing department. To avoid confusion, please ensure your accounts department is aware of how the credit note is being used. If you have questions on how to use the credit note, please contact our accounting department. If payment has already been made on the original order and you wish to receive a refund, please ask your purchasing department to contact our accounting department so that we may gather the correct information needed for the refund. To avoid confusion, please ensure your accounts department is aware of how the credit note is being used. Our accounting department can be contacted by email at us.credits@abcam.com or by telephone using the information at the Contact Us link in the top right corner of our website. Please refer to the credit note ID in any correspondence with our accounting department. The credit note ID is for your reference only and does not automatically guarantee the credit. I hope this experience will not prevent you from purchasing other products from us in the future. Our Scientific Support team is always at your service, should you require further expert advice. I did Immunocytochemistry with Ab32099 antibody from Abcam and control antibody which already tested with purified beta-arrestin2 protein and used for several publications before. The cell type that I used is beta-arrestin1/2 double knockout Mouse Embryonic Fibroblasts ( DKO MEFs). First, I transfected beta-arrestin1 mammalian expression vector in DKO MEFs in 60 mm culture dish and let them express for 48 hr. After that, I split cells into 4 well-chamber slide coated with poly-L-Lysine and fibronectin and let them stabilize for additional 24hr. Cells were fixed with 4% paraformaldehyde for 15 min at room temperature (RT) and blocked with 3% BSA in PBS for 1 hr at RT. First try of staining, I incubated samples with ab32099 antibody for 1hr at RT as described in datasheet and AlexaFluor488-conjugated anti-rabbit secondary antibody was incubated for 1hr at R.T. After that, I looked at my slides under confocal microscope, but I could not see any staining with ab32099 even though I could find stained cells with control beta-arrestin1 antibody. For second try of staining, I tried a longer incubation with ab32099 antibody for 2 days at 4 degree and followed same way like first try for secondary antibody. But still I could not see any stanining with ab32099 and I attached the representative image file for your information. I am so glad that Abcam has Abpromise guarantee and the product that I bought is covered by Abpromise guarantee. For our records, could you please let us know the concentrations of this antibody which you had used in your experiments? Also did you permeablize your cells prior to staining? If so what permeablization buffer was used? I look forward to your reply. Please let me know if you have any questions or there are other ways that Abcam may help you meet your research goals. I purchased anti-beta Arrestin1 antibody (ab32099) from Abcam on Oct-18-2012 because according to the datasheet, this antibody is working for immunocytochemistry. I used beta Arrestin1/2 knockout MEFs cell line for my experiment. It mean there is no endogenous beta Arrestin1/2 that could be give us any background staining with antibody. I transiently transfected Arrestin DKO MEFs with beta-Arrestin1 and followed the method for Immunocytochemistry that described in antibody datasheet. I attach the images from control beta-Arrestin antibody and Abcam beta-Arrestin antibody. As you can check, control arrestin antibody gave us the staining, but Abcam antibody could not even though I used exactly same transfected cell sample. I am sorry to hear that you have been experiencing issues when using this antibody. This product is covered by our Abpromise guarantee. According to Abpromise guarantee, if this product has been purchased within the last six months, we are happy to provide scientific support and to replace or refund the product should we not be able to help. Would you be able to provide details regarding your sample, protocol and troubleshooting step that have been taken. These will not only help me to fully understand the problem but are essential should further testing of this product be needed as well. I look forward to your reply. Please do not hesitate to contact us if you need any more advice or information. We ordered the anti- beta-arrestin 1 and anti- beta-arrestin 2 antibodies from your company recently. The information is as below: Rabbit monoclonal[E274] to beta-arrestin 1 (ab32099) Lot# GR37458-5 Goat polyclonal (ab31294) for the beta-arrestin 2 Lot#GR77572-1 The beta-arrestin1 antibodies works by showing that knockdown of beta-arrestin1 decrease the proper size band. But the anti-beta-arrestin2 is not working (no bands showed up even after overexpression of beta-arrestin2 protein in the cells). I am wondering if you might kindly send us some positive control for beta-arrestin 2 or a new batch of antibody? Thanks & I am looking forward to your reply! Thank you for confirming these details and for your cooperation. The details provided enable us to closely monitor the quality of our products. I am sorry to hear about the difficulties which you have exprienced when using this product and for any inconvenience this has caused. As requested, I have issued a free of charge positive control lysate, ab29466 Brain (normal) Tissue Lysate with the order number xxxxx. To check the status of the order please contact our Customer Service team and reference this number. Should you still be experiencing difficulties, or if you have any further questions, please do not hesitate to let us know. I wish you the best of luck with your research. I used western blot to test the heart fibroblast beta-arrestins expression. The normal RIPA buffer was used to lysis the cells (which was also added with PMSF, Protein kinase inhibitor cocktail). After blotting 30 ug of the protein onto PVDF membrane, the membrane was developed for the western. (5% BSA was used as a blocking buffer and antibody dilution buffer; 1st antibody was developing at 4 degree overnight (1:500 dilution), and 2nd antibody was developing at RT for 2 hours). But finally I could not get any bands for the beta-arrestin2 antibody in the proper size site. Could you kindly send us the positive control to help us to find out if the antibody is working or not. Or we need change to another batch or different Cat# antibody? Thank you for your reply and for these additional details. Would you be able to send me the Abcam order confirmation number for this purchase? I will need this information for replacement, refund or for sending a positive control to you. I have one follow up question regarding this issue. You say thatcould not get any bands for the beta-arrestin 2 antibody in the proper size site. Are you seeing other bands? If so where are these bands located? Would you be able to send an image of your blot to me? This product is covered by our Abpromise guarantee. If we cannot remedy this issue and this is a product that you have purchased within the last six months, we will replace or refund it under our Abpromise guarantee, as you are using it according to specifications listed on our datasheet. Dear Sir/Madam, We ordered the anti- beta-arrestin 1 and anti- beta-arrestin 2 antibodies from your company recently. The information is as below: Rabbit monoclonal[E274] to beta-arrestin 1 (ab32099) Lot# GR37458-5 Goat polyclonal (ab31294) for the beta-arrestin 2 Lot#GR77572-1 The beta-arrestin1 antibodies works by showing that knockdown of beta-arrestin1 decrease the proper size band. But the anti-beta-arrestin2 is not working (no bands showed up even after overexpression of beta-arrestin2 protein in the cells). I am wondering if you might kindly send us some positive control for beta-arrestin 2 or a new batch of antibody? Thanks & I am looking forward to your reply! I am sorry to hear of the difficulties that you have been experiencing using these products and would like to help you to remedy this. Would you mind sending me the details of your experiments such as species type, sample preparation and protocol including any steps that you may have changed while troubleshooting? These details will not only help us to better understand the difficulties you are experiencing but will also be used for internal testing of the products if deemed necessary. We guarantee all our products for TESTED species and applications as listed on the datasheet. The guarantee is valid for 6 months after a purchase. For more details about our Abpromise guarantee please check this link: https://www.abcam.com/abpromise.